As soon as sweet Bing cherries are in season, I cannot resist putting some aside to make this Cherry Cake with its pretty polka dot design. It is very similar in looks to a Cherry Clafoutis, only instead of a thin pancake-like batter, the cherries are suspended in an almond flavored cake batter. It is wonderful when served warm from the oven, with or without a dollop of whipped cream, custard, or creme fraiche. This Cherry Cake has a sponge-like batter that is made by first beating the eggs with the sugar until very thick and light colored. Then vanilla extract is added for flavoring, along with some milk (full fat or reduced fat) and melted butter. Next, a mixture of all purpose (plain) flour and ground almonds (or almond meal/flour) are folded in. I have replaced some of the flour with ground almonds as I like both the almond flavor and the slight graininess it gives the cake. However, if you like you can omit the 1/2 cup (55 grams) of ground almonds and just use 1 1/2 cups (195 grams) all purpose (plain) flour. The final step is to fold in bite sized pieces of fresh sweet cherries (I like to use Bing Cherries). A common problem when adding a heavy fruit like cherries to a cake batter is that the fruit tends to sink to the bottom of the pan during baking. While this in no way affects the flavor of the cake, it does not allow us to appreciate the cherry's full beauty. To rectify this problem, instead of adding all the pitted cherries when we mix the cake batter, we put some cherries aside. Then, about halfway through the baking time, we pull the cake from the oven and quickly place some cherries, that have been cut in half, on top of the partially baked cake. This step, while a little more time consuming, keeps at least some of the cherries floating on the top of the cake. With an added bonus of producing that wonderful polka dot pattern. The cake is baked until golden brown and a toothpick inserted into the center of the cake just comes out clean. If you find the cake over browning, cover with a piece of aluminum foil. As always, it is important to choose your fruit carefully. Look for Bing cherries that are bright dark red, shiny, plump, and quite firm and make sure there is no browning around the stems. Once we have the cherries, we need to remove the pits. Pitting of cherries is always a tedious job and the task is made easier if you have a cherry pitter. However, if you do not own such a tool, than you need to do it by hand. The easiest way I have found to do this, is to make a small slit in the cherry, with a small sharp knife, from the stem end to the bottom of the cherry. Then, using the tip of the knife or your thumbnail, remove the pit. This process is best done over a bowl so any dripping juice will fall into the bowl and not stain your countertop. I like to place the cut cherries on a piece of paper towel to absorb the cherry juices while I make the cake batter. 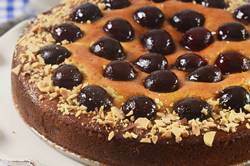 Cherry Cake: Preheat oven to 400 degrees F (200 degrees C). Butter, or spray with a non stick cooking spray, an 9 inch (23 cm) spring form pan and line the bottom of the pan with a round of parchment paper. In a small saucepan, melt the butter. Remove from heat and set aside to cool to room temperature. Rinse, dry, and pit all the cherries. Then take about 14 cherries (about 1/3), cut them in half, and set them aside (place on a sheet of paper towel, cut side down) to be placed on the top of the cake during baking. To the rest of the cherries, cut into quarters (to be folded into the cake batter). In the bowl of your electric mixer (or with a hand mixer), beat the eggs and sugar until thick and light colored (about 3-5 minutes). Beat in the vanilla extract and almond extract (if using). Then fold in, with a rubber spatula or wire whisk, the melted and cooled butter and milk just until incorporated. Next, fold in the flour mixture just until moistened. Gently fold in the quartered cherries (not the cherries that you have halved for the top of the cake). Pour the batter into the prepared pan, smoothing the top with an offset spatula or back of a spoon. Remove from oven and place on a wire rack to cool slightly (about 10-15 minutes). Serve warm or at room temperature with a dollop of softly whipped cream.